Guinness Christmas ornament is an embossed metal design that features a dangling pint of the black stuff. A Guinness pint is the main attraction of this Irish Christmas ornament. The pint is enhanced with a red "jewel" and it is dangling from the center of the 3" diameter metal Guinness ornament with embossed text. This Irish ornament, from The Irish Gift House, is ready to hang with the included red ribbon and is received on a header card. 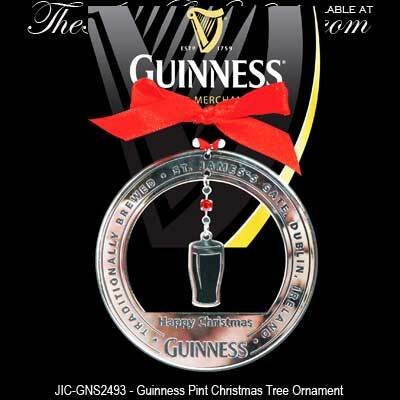 Guinness pint Christmas ornament features a black and cream design along with red branded ribbon. Guinness Christmas ornament is an embossed metal design that features the famous toucan.